All campers must be 19 years of age or older, unless accompanied by a parent or guardian. All vehicles must clearly display a valid park pass on the right hand side of the windshield. Do not take more space then your site. All vehicles must be parked on the camping site or at designated parking areas. Do not leave fires unattended. Firewood may be purchased at the Park Office. Please keep fires small. Small campfires conserve firewood and reduce the risk of fire damage. Quiet time is 11:00PM to 7:00AM. During this time no unnecessary driving in the campground areas, no music and voices must be kept down. If you are asked to turn down music or noise, respond politely and promptly. Lack of respect for Park Officials will result in immediate eviction from the Park and registered campers may not be allowed to rent a site in the future. Alcoholic beverages may be consumed in the permit holder’s camping unit, and on their assigned campsite in accordance with The Alcohol and Gaming Regulations Act, 1997 as per section 107 (1) per 139 (1) except during the May long weekend when an alcohol ban is in effect. No underage alcohol consumption is allowed. Pets must be kept on leashes at all times. Pets are not allowed in public structures or buildings, on beaches or in swimming areas. Keep pets quiet and ensure that they do not become a nuisance, danger or threat to the comfort or safety of any other person or wildlife. Clean up promptly after your pets. All operators of golf carts, within the Park, must be 16 years of age or older with a valid driver’s license. All golf carts must be registered at the Park Office and can only be operated on specified roads. 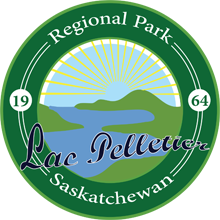 Park users may not remove any sign, facility, turf, rock or the whole part of any flower, plant, shrub or tree. It is unlawful to discharge, discard or dispose of any liquid or solid waste other then in to a provided sewage system or receptacle. Upon leaving, your campsite must be tidy, and garbage placed in the barrels and not in the firepits. Wildlife is present in the park; it is important for the safety of all to maintain a clean campsite.